is a composition for tongue, sometimes in counterpoint with audible breath. - and tongue movements, wich articulate a (chance) text, based on a given material of phones, the atoms of language (syllables and smaller). Through breath they are made audible from time to time (whispering). Tongue movements and breath function as independent layers which interact. Lips and jaw don't move. They only open at the beginning to a relaxed position and close at the end. The notation uses three different techniques: a movement notation which was developed just for these tongue movements (based on Eshkol-Wachman movement notation); graphic notation; the International Phonetic Alphabet. The score consists in material from which the performer chooses, and suggestions for a structure. The piece works with the root of articulation. It is a work for voice/s and at the same time a scenic composition. Music theatre in a compact form. zunge lösen was premiered in 1999 by Tilmann Walzer at Zionskirche Berlin. In 1999 as well Anna Clementi played her version at "Experimentelle & Neue Musik im Lichthof" in Berlin. Christian Kesten showed his own version in 1999 at "wandelweiser werkstattkonzert" in Berlin, 2000 at the festival "moments musicaux" in Aarau/Switzerland and at Künstlerhaus Lukas Ahrenshoop, in 2001 at Alte Feuerwache Friedrichshain, Berlin. MAULWERKER and Emmett Williams played zunge lösen in a version for six performers, sitting on a row of chairs side-by-side, in 2001 at Museo Vostell in Malpartida/Spain. In March 2002, MAULWERKER (Ariane Jeßulat, Henrik Kairies, Tilmann Walzer) presented their trio version at Philipp Melanchthon church in Berlin. In October 2002, MAULWERKER (Ariane Jeßulat, Henrik Kairies, Christian Kesten) played a trio version at Festival "Randspiele" in Zepernick, close to Berlin. 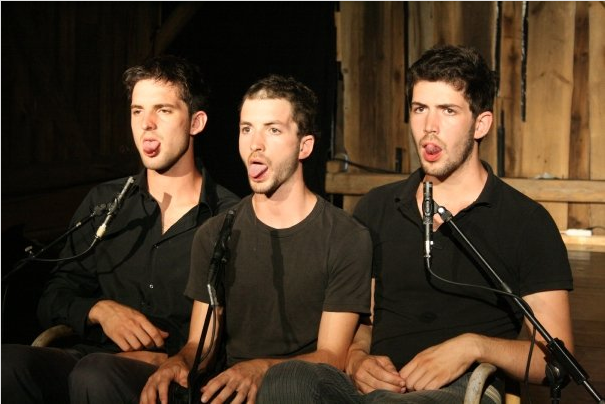 In April 2007, Orin Hildestad, Adam Overton and Mark So presented a trio version at Dangerous Curve, Los Angeles. Hildestad, Overton, So and Corey Fogel performed a quartet version in November 2008 at the wulf., Los Angeles. Christian Kesten showed a solo version in April 2007 at Villa Aurora, Los Angeles, and at Rat Manse Concert Series, Berkeley, San Francisco. In March 2008, he played the piece solo at Red Room, Baltimore | HUB 14, Toronto | Perte de Signal, Montréal | Experimental Intermedia, New York | AS220, Providence | Massachusetts College of Art, Boston | Bowerbird, UCAL, Philadelphia | Fotòfono, Brooklyn. In January 2009, he performed the piece at loop-line, Tokyo. The trio version was performed by MAULWERKER Ariane Jessulat, Henrik Kairies and Christian Kesten at "Maulwerker: speaking in tongues", Pergamon Museum Berlin, at exhibition BABYLON. Myth and Truth, on August 16, 2008. Simon, Peter and Philipp Mayer played their trio version at three days in a row at the festival SPIEL09, August 6 - 8, 2009, at Andorf, Austria. Zunge Lösen from Alpine Chocolate on Vimeo.